If you want more civility, then you vote for folks who are civil and who are making arguments and using logic and presenting evidence, not just somebody who is popping off. Logic and evidence are good, however, the workplace is unique. For most of us it is not about making speeches and rhetoric. For the everyday person, the workplace is personal. It is where we spend most of our day. If we want it to not be toxic like our political space we need to speak up and listen in the midst of conflict in order to get work done. Poise is the mindset we take when problems arise. One mindset that is helpful is to decide to get good at conversation. Conversation is a give and take exchange the can open our eyes to another person’s perspective. The quote below, reminds us that our only power to change things for the better comes from our own perspective. If we don’t like the reality we see, we can change our perspective. let us change the eyes which see reality. In the post titled Compassion: An Antidote to Incivility, we wrote about the concept of fight or flight. Poise comes from an awareness that we are standing on fragile ground when there is conflict. Without thinking we will retreat or react because of our brain’s ability to protect us. Here is a workplace example of a conversation that maintains poise and supports a co-worker, first to be seen, and then to see others people with new eyes. Person A: People from (another department) are lazy and rude. We always have to redo the work that they should be doing. Person B: Are you frustrated about something in particular? Person A: Yes, when a customer calls they complain about (another department). If they took the time to do it right in the first place, we wouldn’t have the call. Person B: I can see why you are frustrated. What have you tried to do to make it better? Person A: I complained to the manager but ____ is a lazy @#%& too! Person B: Bummer. I wonder if there is another reason the time isn’t being spent on the customer in the first place? Person A: Yeah, maybe there is some rule about limiting the time with each customer. Person B: Perhaps. Do you ever see anyone from ___ on break? Maybe you could ask them what it is like? Person A: Yes, but I don’t see what good that will do? Person B: I don’t know either but it would be interesting to know what you find out. Let me know after you talk. Curiosity: Person B used mostly questions to approach the person speaking. Intention: Person B had the intention to first affirm the speaker and then to use questions to broaden the perspective of the other person. If Person A was speaking from a mindset of “fight,” the approach would be to either prove the speaker wrong or to tell them the right way to do it. If Person A was coming from a place of “flight,” they would excuse themselves. In times of emergency, telling a person how to do something is the best approach. Or if there is simply not time to engage in a conversation, excusing oneself works well. When there is time, engaging in a strong powerful conversation is better than just letting the conversation become a complaint or gossip session. Soon we will be sharing more about the research that tells us that complaining and gossip lead to a lot of negative results. Do you agree? Do you think taking time to engage in conversation to better understand the perspective of others can make a difference? If so, let us know. Seeds of Civility is a blog that is created by The Wallace Centers of Iowa. 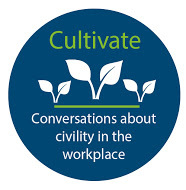 We cultivate conversations about leading (and developing emerging leaders) with civility.